J@§¤ñ wrote to tell me about how he extended my 5-in-1 network admin's cable to build a dual-purpose Ethernet and RS-232 tap. Very nice! I traveled to Fairbanks with a small hot wire gear cutter and parts to make a large one. At Belfair I spent the better part of two days making the large gear cutter and an axle guide prior to the start of the event. The structures were made primarily of balsa wood, fragile but lightweight enough to allow for gradual, gravity powered gear cutting without bending the resistance wire. Lars had the bright idea that I could use a single axle guide with the small and large gear cutter mounted at either end. We decided that this configuration looked somewhat like a satellite. I didn't try to make a gear until the third day of the competition. By that time my power supply had apparently fallen off of one of our work benches and sustained some damage from the low temperature impact. The case was broken, and the Kapton tape holding the transformer to its mount had broken (They use the stuff to make space suits, so you'd think it would hold up in cold temperatures! I guess I must have had it against too sharp of an edge.) Fortunately, the wiring was intact, and current was delivered to the gear cutter as I attempted to make our pinion. When I tested the hot wire gear cutting technique at home, I ended up with a nice gear and a puddle of water. 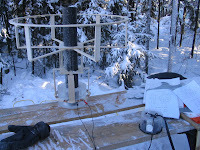 Unfortunately, the colder temperature (-20°F or so) during the competition didn't allow for a similar result. No liquid water escaped at all, and I helplessly watched the device pass slowly through the entire cylinder of ice while all of the melted water re-froze immediately behind the hot wires. I tried adjusting the voltage. More power made it work faster but also caused cracks to appear in the block of ice; no setting prevented the horrifying re-freezing. With only a half an inch to go, the power supply failed for an unknown reason (temperature affecting the semiconductor in the TRIAC dimmer switch? ), so I began using the backup power supply (same design, smaller transformer). It finished the job, but I was left with a solid cylinder of ice trapped within the gear cutter assembly. Only a hint of a gear shape was visible. 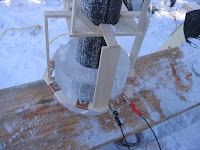 I was almost ready to give up on making gears at all, but I figured that there was a chance that the technique might work if the individual resistance wires were bent slightly upward so that gravity could pull the liquid water along the hot wire toward the outer edge of the ice block. I decided to flip the whole contraption over, tweak the wires, and run it upside-down, passing the wires through the gear blank in the opposite direction. Even if it didn't work, I would at least free the ice from the gear cutter. Here's a fun exercise to try at home: Place all your fine china or other fragile valuables in a large box with a bowling ball in the center. Don't use any packing material. Take the box for a walk around the block, flip it upside-down at least once, bring it home, open it, and witness the destruction. This is pretty much what it was like turning the balsa wood frame around with a block of ice trapped inside. I thought I could turn it over (holding the ice, not the wood) and pass it up from beneath the sawhorse workbench, but it was too big, or I was too clumsy, and it was, well, a disaster. I did finally manage to get the small gear cutter in place, upside-down, over the gear blank resting on temporary supports, but the large gear cutter was badly damaged and completely separated from the axle guide in the process. I bent the resistance wires, attached the backup power supply, turned it on, and nothing happened. The backup power supply had failed! Thus our quest for gears ended. Perhaps last year's technique would have been better, but the speed advantage of hot wire cutting seemed tremendous. 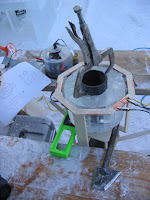 After this experience and our first field use of The Boiler (Lars's hot tube cutting machine - effective but slow and with some cracking), we've determined that no heat cutting technique should be used in sub-zero weather. If we decide to use heat cutting in the future (and the speed advantage may well lead to that decision), then we will have to perform the operation on warmer ice with a warmer ambient temperature, perhaps in a tent. Here are a couple photos of the completed piece. It is a working music box that plays one note. When the crank at the front is turned, a cam lifts and then drops a hammer that strikes a vertical chime. The frame structure on the left ended up being completely superfluous because our chime was attached directly to the floor. Dan Gottesman graciously offered quite a few photos he took of our project. Here they are in chronological order. We started out by carving a few slabs off of our block. 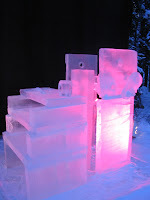 We used a chainsaw with a 42 inch bar and a helper handle to follow lines scribed into the ice. At first we tried etching the lines with sharp things, but we eventually figured out the easiest way we had to mark the ice was with pencil. The pencil markings could be erased quickly with a chisel. Breaks in the warming hut were essential as the temperature was rarely above -15°F. I heard that the average temperature during the competition was -23°F and that it was the first time in the history of the Single Block Classic that it never exceeded 0°F over the course of the three day event. We used small, electric chainsaws to carve parts out of the slabs. Here is one of the saws next to one of Lars's homemade chisels. We tried cutting slabs at night, but it turned out to be tricky. At temperatures below -20°F or so, the ice tended to crack. We never lost a whole slab, but some significant fractures appeared along the edge closest to the gas engine of the giant chainsaw. 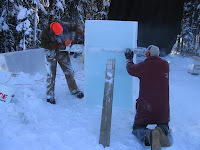 Lars noticed that the exhaust port on the saw pointed directly at the ice where it had cracked, so we decided that slab cutting would be a daytime-only activity until a modification could be made back at the shop. We were fortunate to have the aurora borealis overhead as we worked into the night. It is always a treat to see the lights in Fairbanks. This display was fairly bright and active. There were two distinct bands of light that rippled quite a bit. We were worried about how long an axle we would be able to turn on the lathe, but we ended up having no trouble producing axles of more than 50 inches. Roughing out parts with chainsaws turned out to be the safest nighttime activity. The drill press carriage assembly and custom 3.5" drill bit Lars made worked wonderfully. Here you can see a hole ready to receive a lathe-turned axle. We had some scary moments while assembling the chime frame that consisted of three horizontal shelves. The extreme temperatures made it difficult to waterglue ice. As soon as more than a few drops water or slush hit the ice, significant cracks appeared. Also, the frame pieces didn't fit together as well as we would have liked, mostly due to our slab cuts not being perfectly planar (though they were much better than last year's). The middle shelf broke apart into several large pieces while I was trying to level it for gluing. I was amazed that the lower shelf stayed intact when all the pieces landed on it. After that event, we came up with a bonding method that caused less cracking and also allowed for less precision: spreading a layer of dry snow between the parts, wiggling them into position, and then spraying the snow with a small quantity of liquid water. Throughout the competition, we followed diagrams in a book I had printed using QCad. As the event wore on, we made more and more notes and modifications to the designs in the book. 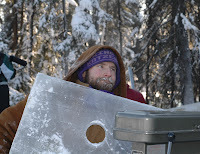 Lars used a hot tube cutter ("the boiler") with a sheet steel template to carve the hammer. The boiler worked well but very, very slowly. Unfortunately, it tended to create cracks in the ice, especially when used at night. We had the same problem with hot wire cutting, so we came to the conclusion that heat cutting is generally useless below about -20°F (maybe higher). If we decide to use heat cutting in the future, we will have to warm the ice up to a workable temperature before doing so. As night fell on Thursday, we were working on the final assembly of our simplified music box. We had to pack a considerable amount of snow between the front frame pieces in order to get the axles aligned correctly. Ice was cracking like crazy when it came in contact with more than the tiniest amount of water, but I found that I could get the snow to stay in place with just a little moisture from my own breath. I brushed snow off of the piece while Lars worked on the last few parts. The cracking power cord on the die grinder held up just long enough for Lars to finish the bushings needed for the axle assemblies. I kept scraping and brushing snow off the ice until the bushings were finished. Just before the horn sounded, we put the axles in place with all of the parts attached. Unfortunately, it wasn't until the next day that we were able get the music box working. 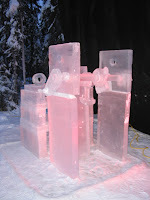 Check out the official Ice Alaska page for our creation at the Single Block Classic. Shortly before the final photo was taken we affixed the crank handle to the front and made a few invisible modifications to allow the piece to function. It isn't much to look at, especially from the front, but it works. We should have turned the entire piece 45° so that you can better see the mechanical parts. Hilariously, the sculpture is titled Counterclockwise, but it only works when turned clockwise. That should confuse some people. Lars carved a clockwise arrow above the handle that will hopefully get the point across. Unfortunately the mechanical parts are likely to break if it is turned the wrong direction; this was why we had originally planned to add a ratchet. Oh well. We'll see how long it lasts! I need to catch up on sleep before posting more of the story (and a whole bunch of pictures), but our effort to make the single chime mechanism work on Friday afternoon was a success! We turned the crank, the hammer hit the chime, and nothing broke! Unbelievably, it was still working when we returned a few hours later. After an afternoon discussion, Lars and I decided to simplify our design and attempt to complete it by the 9:00 PM horn marking the end of the competition. If the piece wasn't done at 9:00, we would voluntarily disqualify ourselves and keep working until finished. Lars: "Art may break out at any moment!" The simplified design consists of a single chime struck by a hammer once per rotation of a crank. It eliminates many parts that were required by the design capable of playing a tune but is still mechanical, interactive, and musical. We finished making all of the required parts and were installing the axle assemblies as the clock ticked toward 9:00. When the horn sounded, all of the parts were in place except for the crank, and the sculpture only needed some waterglue and a little re-positioning of the chime before being completely functional. Since we were so close, and the piece was starting to look pretty cool, we decided not to forfeit the competition. Instead we packed up our things, cleaned up the site, and headed home after one last donut from the warming hut. We'll return on Friday afternoon, during the warmest part of the day, to finish the piece and make it work. A combination of technical difficulties and general lack of time have prevented me from updating the blog as often as I would have liked. As of lunch on Thursday, the last day of the competition, we are doing well but are behind schedule. Our tools have been working as intended this year, but we are finding that, even with better tools, carving each individual part takes quite a bit of time, sometimes well over an hour for a single part. We need to find ways to increase our speed! We have made excellent progress this morning thanks to a few speed improvements, but there is still much more to do. At some point today we will have to decide whether or not we will simplify our design to get something working tonight. Another alternative would be to continue carving tomorrow, although our piece would be incomplete for judging tonight. Either way, we are doing much better than last year despite experiencing worse overall weather. The giant chainsaw has been working very well for slab cutting. We've cut full slabs from two inches to six inches thick, and not a single slab has broken. The only improvement we can envision would be some kind of guide to keep our cuts straight. Our cuts haven't been horribly crooked, but a little more consistency in our slab thickness would help quite a bit.